Brinner : The best Monday yet! Today I get to meet my long-awaited nephew! Super excited! He was born very early this morning and both him and my sister-in-law are doing well. I wasn't actually planning on posting anything, but as I only get to go meet him later this afternoon, I now have some unexpected time to write. Monday's have been for mail recently, so I think I'll continue with that. I haven't yet quite decided if this is going to be an ongoing feature in the blog, but it works for me so far. 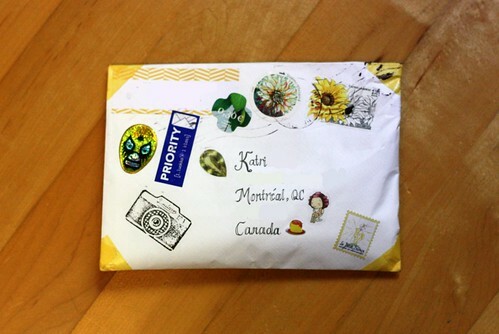 I find that looking at pictures of mail sent and received by others often gives me motivation to write another letter or try out some new ways to decorate my outgoing mail. Last week was a pretty busy one when it comes to mail. 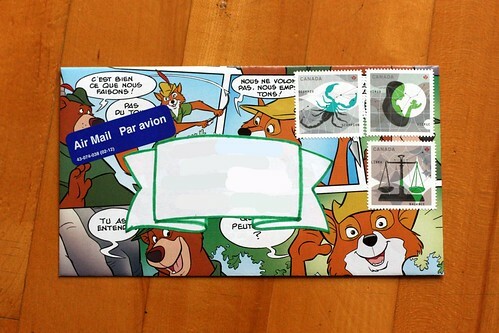 I tried a few new things in my outgoing mail, so I'm actually showing a few more than usually. This first one is actually a reply to a penpal ad, believe it or not. I haven't done that... well, never, so it's pretty exciting. I found an interesting ad (it was really the discussion that followed the ad over in the comment box that made me respond) over at Penpal of the Week. 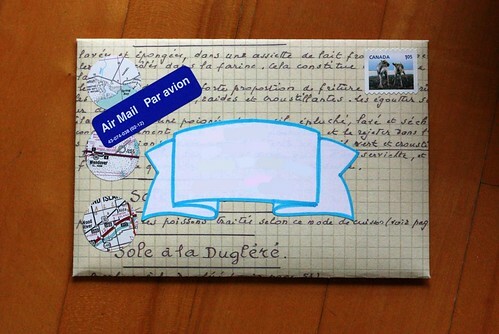 It's a blog by Julie and talks a lot about snail mail and penpals. You can submit your own ad or respond to others. You should totally check it out! 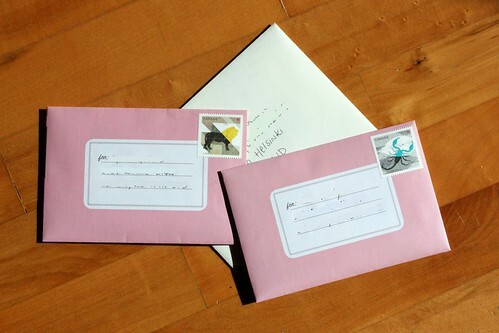 Here we have a few pink ones going to my Canadian mail buddies. The white one in the background is in a plain white envelope, which is generally very rare for me and looks a little boring. However, the reason I'm sending it is not. It's going to my "adopted grandpa" (he's not my real grandpa, but has been with my grandma for about forever, so he might as well be) who's turning, can you believe it, 89 years old. He's going strong but is apparently not partying it up this year. He's saving his energy for his 90th birthday bash next year. 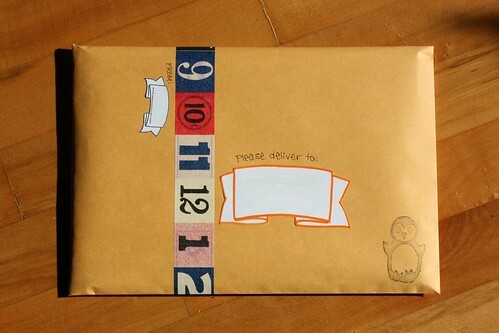 Then we have a random washitape, banner sticker and penguin stamped large envelope. This one is probably the more unexpected one of the lot. I know quite a few pieces of the mail I send is, if not exactly expected, not really a surprise either. This one I think is. It's nice to send something like that every once in a while. This one's off to Finland. The last two are actually orders from the shop. I've mentioned before that I rarely photograph them as I tend to often use very similar ways to package them. These are a tad different. The first one I just loved the stamps. Sometimes it's fun to use a ton of different ones. The second one, as you can see, was made of a Robin Hood book (en francais, no less). I rescued the book sometimes in May and had a few leftover pages from the cards I made. Another weekly delivery of letter-y goodness and Icelandic chocolate from Susanne. 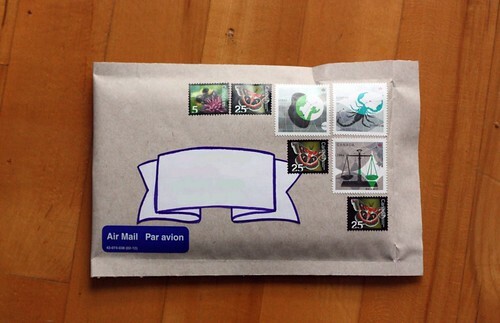 I love the envelopes (not to mention the insides too obviously) and get so excited every time I get one. Thanks again Susanne! Happy October everyone! How has your week and month started?